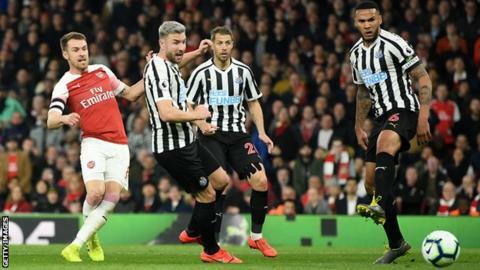 Arsenal beat Newcastle at Emirates Stadium to move above Manchester United and north London rivals Tottenham and go third in the Premier League. Aaron Ramsey, who had an earlier effort disallowed following a foul, put the hosts ahead with a fine low strike from 15 yards out. Newcastle’s Matt Ritchie produced a diving header on the goalline to deny Alexandre Lacazette, but the Frenchman doubled Arsenal’s lead late on when he calmly lofted the ball over goalkeeper Martin Dubravka. The visitors’ best chance fell to Salomon Rondon and his low shot was pushed wide by Arsenal goalkeeper Bernd Leno. Arsenal were 10 points behind Tottenham at the start of February but this victory took the Gunners two points clear of fourth-placed Spurs and United in fifth with seven league games remaining. This was a 10th home league victory in a row for Arsenal, their best run since a similar sequence from December 1997 to May 1998, as Unai Emery’s team continued a strong second half of the season that could see them secure a return to Champions League action after a two-year absence. Arsene Wenger’s 22-year spell in charge of the Gunners ended with regular protests among the fans as they watched their team drift away from Europe’s elite. But Emery, in his first year in the English game, has galvanised the side with his brand of free-flowing attacking football and this result took them to 63 points – the same that the Gunners managed under Wenger in all of 2017-18. 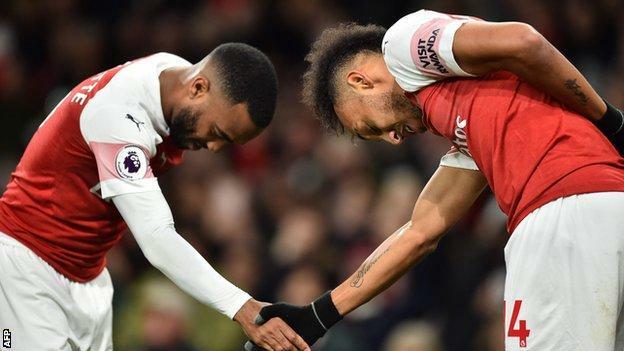 Arsenal started with top scorer Pierre-Emerick Aubameyang on the bench, but they still had 71% possession and were simply too strong for their opponents. The hosts thought they had taken a 12th-minute lead, but Ramsey’s volley was ruled out as Sokratis was adjudged to have fouled Florian Lejeune. But the Welshman, who missed his country’s two matches during the international break, scored 17 minutes later with a low strike after DeAndre Yedlin’s clearance inadvertently fell into Ramsey’s path. The home fans were nearly celebrating again just before half-time, but Lacazette’s powerful effort was spectacularly headed off the line by Ritchie with Dubravka beaten. After Sokratis headed wide and substitute Aubameyang had a shot saved, Arsenal got the second goal they deserved through Lacazette’s calm finish after Aubameyang’s flicked-on header set up the chance. 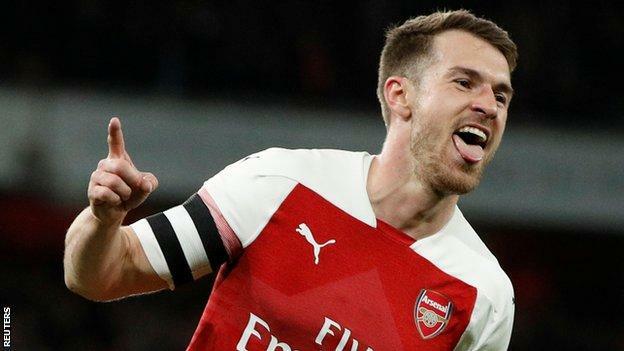 The only negative from the evening was Ramsey, who will join Juventus on a free transfer in the summer, going off with an injury midway through the second half. Despite the Gunners fluidity, there was only a combined total of 10 shots from both sides, the fewest in a Premier League game since the nine efforts in the Bournemouth versus Leicester match in August 2015. It was a tough night for Newcastle as they saw little of the ball and spent a lot of the time chasing it unsuccessfully against their dominant opponents. The visitors only had one shot on target in the opening 45 minutes, when Rondon proved too strong for Sokratis but saw his low strike pushed wide by Leno. Even though Arsenal central defender Shkodran Mustafi looked a weak link as he repeatedly lost the ball, Newcastle struggled to create chances. Indeed, they did not have a shot on target after the break with Ki Sung-yueng shooting wastefully wide from the edge of the area in a rare opportunity to equalise, before Lacazette sealed the three points for the home side in the 83rd minute. After their 2-2 draw at Bournemouth on 16 March, Magpies’ boss Rafael Benitez said Newcastle needed one more win to secure their Premier League status and they have six games left to do that. However, they are seven points clear of 18th-placed Cardiff and still have to play three of the six teams below them – Southampton, Brighton and Fulham – so it would be a major surprise if they dropped into the Championship. Arsenal were really, really impressive. They have been flying at the Emirates all season. When you think about it, the top four looked too far away at the start of the season but it’s in their hands now, although five of the last seven [games] are away for them. They limited Newcastle to very few chances. You feel Arsenal fans are right behind Emery. In some ways they are overachieving this season. Arsenal have won 10 consecutive Premier League home games within the same season for the first time since May 1998. Arsenal have kept three consecutive clean sheets in all competitions for the first time since December 2017. Newcastle have lost 28 Premier League games against Arsenal – no other side has beaten them more often in the competition. Arsenal are finishing a Premier League matchday ahead of Tottenham in the table for the first time since 2 December, after they beat their north London rivals 4-2. Twenty of Arsenal striker Alexandre Lacazette’s 27 Premier League goals have come in home games (74%). Arsenal have won all 17 of their Premier League home games in which Aaron Ramsey has scored for them. Despite making only five substitute appearances this season, no player has been involved in more Premier League goals as a sub in 2018-19 than Arsenal’s Pierre-Emerick Aubameyang (six – four goals, two assists). Arsenal manager Unai Emery, speaking to BBC’s Match of the Day: “We played very consistent over 90 minutes. We didn’t concede any chances. We created and dominated the match. We are happy. “Each match is very difficult – we got three points and did it our way. It’s a nice challenge to win consecutive matches – it’s a new history – and we’re creating our own way. We’re in a good moment but each match is a new test. “I hope Ramsey’s injury is not serious. The doctor is thinking it’s a small injury. Newcastle manager Rafael Benitez, speaking to BBC’s Match of the Day: “We played against a good team and were fine for a while in the first half. We could avoid their goal, it was a little bit lucky. “We had situations on the counter attack where we could be more dangerous but we didn’t do it. The last 10 minutes they had chances to score but until the second goal we were pushing. It is a shame because you could feel the atmosphere was getting nervous. “When you play top sides away it can be a mistake which makes the difference. In the end it was a mistake and we must learn from this and be ready for the next one. Arsenal are next in action with a Premier League away game at Everton on Sunday, before a home match against Napoli in the first leg of their Europa League quarter-final on 11 April. Newcastle entertain Crystal Palace on 6 April and then face Leicester away from home on 12 April. Match ends, Arsenal 2, Newcastle United 0. Second Half ends, Arsenal 2, Newcastle United 0. Matteo Guendouzi (Arsenal) wins a free kick on the left wing. Foul by Yoshinori Muto (Newcastle United). Corner, Arsenal. Conceded by Mohamed Diamé. Attempt blocked. Henrikh Mkhitaryan (Arsenal) left footed shot from the centre of the box is blocked. Assisted by Alexandre Lacazette. Offside, Newcastle United. Ki Sung-yueng tries a through ball, but Salomón Rondón is caught offside. Foul by Jamaal Lascelles (Newcastle United). Martin Dubravka (Newcastle United) wins a free kick in the defensive half. Corner, Arsenal. Conceded by DeAndre Yedlin. Attempt missed. Salomón Rondón (Newcastle United) right footed shot from more than 35 yards misses to the left. Substitution, Arsenal. Henrikh Mkhitaryan replaces Mesut Özil. Goal! Arsenal 2, Newcastle United 0. Alexandre Lacazette (Arsenal) right footed shot from the centre of the box to the centre of the goal. Assisted by Pierre-Emerick Aubameyang with a headed pass. Attempt missed. Ki Sung-yueng (Newcastle United) right footed shot from outside the box is high and wide to the right. Assisted by Salomón Rondón. Substitution, Newcastle United. Yoshinori Muto replaces Ayoze Pérez. Substitution, Newcastle United. Kenedy replaces Matt Ritchie. Attempt saved. Pierre-Emerick Aubameyang (Arsenal) right footed shot from the right side of the box is saved in the bottom right corner. Assisted by Mesut Özil. Offside, Newcastle United. Paul Dummett tries a through ball, but Miguel Almirón is caught offside. Miguel Almirón (Newcastle United) wins a free kick in the defensive half. Sead Kolasinac (Arsenal) is shown the yellow card. Nacho Monreal (Arsenal) wins a free kick on the left wing. Mesut Özil (Arsenal) wins a free kick in the defensive half. Substitution, Newcastle United. Ki Sung-yueng replaces Isaac Hayden because of an injury. Substitution, Arsenal. Mohamed Elneny replaces Aaron Ramsey because of an injury. Delay in match Aaron Ramsey (Arsenal) because of an injury. Attempt missed. Sokratis (Arsenal) header from the centre of the box is close, but misses to the left. Assisted by Mesut Özil with a cross following a corner. Corner, Arsenal. Conceded by Paul Dummett. Offside, Arsenal. Pierre-Emerick Aubameyang tries a through ball, but Mesut Özil is caught offside. Substitution, Arsenal. Pierre-Emerick Aubameyang replaces Alex Iwobi. Nacho Monreal (Arsenal) is shown the yellow card for a bad foul. Foul by Nacho Monreal (Arsenal). Miguel Almirón (Newcastle United) wins a free kick in the attacking half.